In Spotify, you can tag and edit the track information. Every MP3 or AAC file isn’t just a piece of audio. Just like a digital photograph can contain extra information (about the camera used, exposure settings, the time it was taken, and so on), a digital music file can also contain information, called metadata, that identifies and tags a track. Most likely, your local files have already been tagged for you by Gracenote, but sometimes, you may want to input your own descriptive content for tracks (including adding your own track name). For example, you might need to input this info if the album isn’t in the Gracenote database. You can also change information to organize your music files in a certain way. For instance, you might want to add a classical music track’s original composer to the Artist field, rather than the performer who’s actually playing the track. Or maybe you want to remove the definite article before an artist’s name, such as The Who or The Beach Boys (although the software is smart enough to alphabetize artists correctly, ignoring the articles). In Spotify, select Local Files in the left sidebar. The Local Files pane opens. Select the track whose information you want to change. To edit a selection of tracks at the same time, rather than just one, select the first track, and then Shift-click the last track. All the tracks between these two are highlighted. 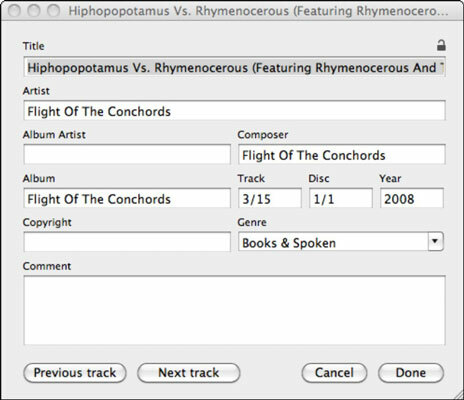 To choose multiple tracks that aren’t listed together or to undo the odd highlighted track, hold down the Ctrl key (Command on the Mac) while you click each one. Select Edit Info from the pop-up menu that appears. Select a field that you want to change, and then enter the new information. Repeat this step for all the entries you want to change. (Optional) If you want to change the genre assigned to this track, click the selection below Genre, and then select the option you want from the drop-down list that appears. Click Done when you finish making changes. Your changes are saved, and you go back to Spotify. Choosing multiple items to edit at the same time can cause headaches if you make a mistake. Remember that what you change in the metadata applies to all the items you’ve selected.